During World War II all sorts of essential and non-essential foods were rationed, as well as clothing, furniture and petrol. To make the British weak, the Germans tried to cut off supplies of food and other goods. German submarines attacked many of the ships that brought food to Britain. Before the war, Britain imported 55 million tons of food, a month after the war had started this figure had dropped to 12 million. The Ration Book became the key to survival for nearly every household in Britain. Every member of the public was issued with a ration book. Why were there different colour ration books? 'The colour of your ration book was very important as it made sure you go the right amount and types of food needed for your health. Green ration books - Pregnant women, nursing mothers and children under 5. They had first choice of fruit, a daily pint of milk and a double supply of eggs. Blue ration books - Children between 5 and 16 years of age. It was felt important that children had fruit, the full meat ration and half a pint of milk a day. 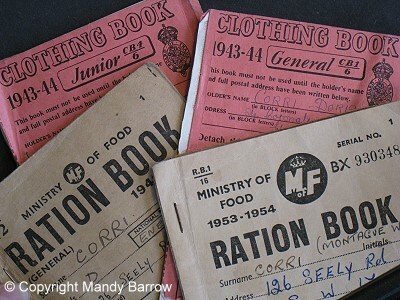 Why did the government issue ration books? To make sure that everybody got a fair share of the food available. The government was worried that as food and other items became scarcer, prices would rise and poorer people might not be able to afford things. There was also a danger that some people might hoard items, leaving none for others. Rationing was introduced to make sure that everyone had a fair share of the items that were hard to get hold of during the war. Rationing was introduced at the beginning of 1940. On National Registration Day on 29 September 1939, every householder had to fill in a form giving details of the people who lived in their house. Using the information gathered on National Registration Day, the government issued every one with an identity card and ration book. Each family or individual had to register with a local supplier from whom the ration would be bought. These details were stamped in the book and you could only buy your ration from that supplier. The books contained coupons that had to be handed to or signed by the shopkeeper every time rationed goods were bought. This meant that people could only buy the amount they were allowed. Some people considered food rationing to be very unfair. Eggs, butter and meat could be obtained fairly easily without coupons in rural areas. By the summer of 1941 greengrocers in the towns were taking their lorries into the country to buy vegetables direct from growers. When did food rationing stop? Fourteen years of food rationing in Britain ended at midnight on 4 July 1954, when restrictions on the sale and purchase of meat and bacon were lifted. This happened nine years after the end of the war. "I lived in Godalming & London during WW2. I was 12 at the start, 18 at its end (an apprentice in an aircraft factory). One point that your pages on rationing did not bring out was, that in most families at least one person was working & consequently relieved the ration situation at home by eating out. I for example had a lunch in the works canteen and a sandwich with tea at the two other breaks during the day. Even classified as a "Boy" I was working 54 hours a week and did evening classes on three nights (having supper at the 'tech canteen). Another member of my family was a shop assistant during this period. Because of the shortage of staff, her lunch break was too short to go home so she eat at a restaurant (Often Lyons, where Welsh Rabbit (cheese on toast) cost 4d or a hot meat pie 7d). Many schools also had school dinners. All in all, many families really had double the official ration because they ate at their place of work."